And finally, there is Audi. Late Monday night, the German luxury maker debuted took to the stage in San Francisco with its long-awaited, first volume battery-electric vehicle, a five-seat midsize crossover utility to be known simply as e-tron. It also opened reservations and will allow customers to configure the car, requiring a refundable $1,000 deposit. Audi didn’t release estimates of the e-tron’s ratings for electric range, but earlier estimates put it at about 250 miles. That information will be released closer to the start of deliveries, which will begin in the U.S. between April and June of 2019. 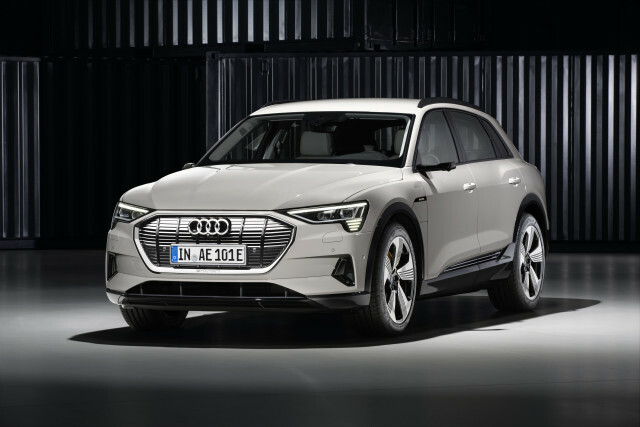 The Audi e-tron will compete with the Jaguar I-Pace, due at U.S. dealers this November or December, as well as the Mercedes-Benz EQC and BMW iX3, scheduled to arrive in 2020. Prices for the e-tron range from $74,800 for the Premium trim level to $86,700 for the first Edition One models. Buyers will be eligible for the full $7,500 federal income-tax credit and various state incentives. 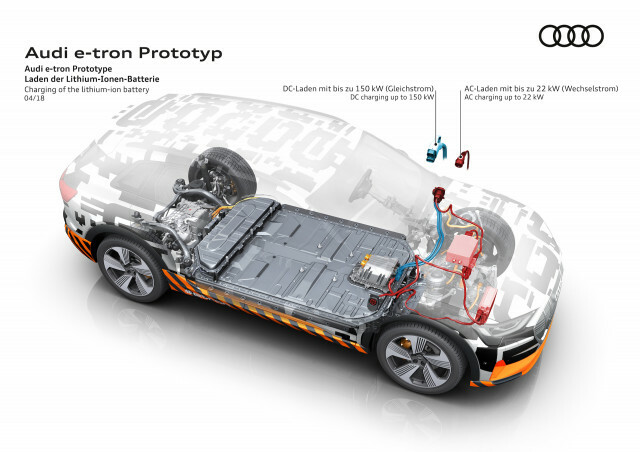 The 2019 Audi e-tron itself is proportioned very much like a conventional crossover, reflecting underpinnings adapted from the company’s MLB architecture for all-wheel-drive vehicles with longitudinal combustion engines. 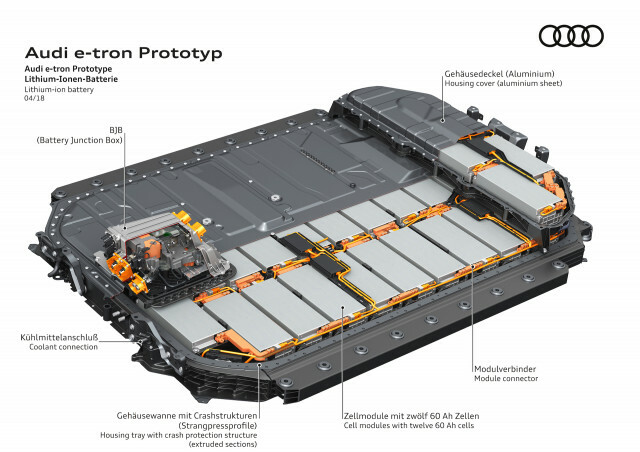 The version used for the e-tron has no engine, but a pair of transverse electric motors, one per axle. Audi suggests the conventional proportions, along with design elements that subtly underscore the electric propulsion, will reassure buyers who don’t want an electric car that looks strange. Its grille, headlamps, and taillights are utterly consistent with other Audi utilities, though the grille itself is actually a silver-textured blanking plate. The car’s sides may also be a bit smoother. The interior is even more conventional, and we’d wager many Audi aficionados could check it over inside and out and never know from the looks that it was propelled electrically. It’s a diametrically opposed approach to that of Jaguar, whose I-Pace takes full advantage of its dedicated “skateboard” underpinnings with long-cabin, short-nose proportions more similar to the Tesla Model 3. The market will determine whether one approach is more successful than another. Audi says the e-tron’s cabin design “represents performance, intelligence, and lightness,” which translates to the expected pair of digital displays, one in the cluster behind the steering wheel and another in the lower center of the dash. The e-tron has several missions. First, it gives Audi a luxury electric vehicle to sell in China, by far the world’s most aggressive market for electric vehicles today. Second, it gets Audi into the market for luxury electric cars that’s been owned for six years exclusively by Tesla—though how the brands compare in cachet in that rarified niche remains to be seen. Audi has one feature, however, that challenges Tesla head-on, one that Jaguar can’t match. That’s built-in DC fast charging at up to 150 kilowatts, slightly higher than Tesla’s current cap of 135 kw at today’s Supercharger stations. The company says that will allow the battery to recharge to 80 percent of capacity in 30 minutes or less. Audi does not, however, presently have anything comparable to the Tesla Supercharger network of hundreds of sites with thousands of charging outlets. 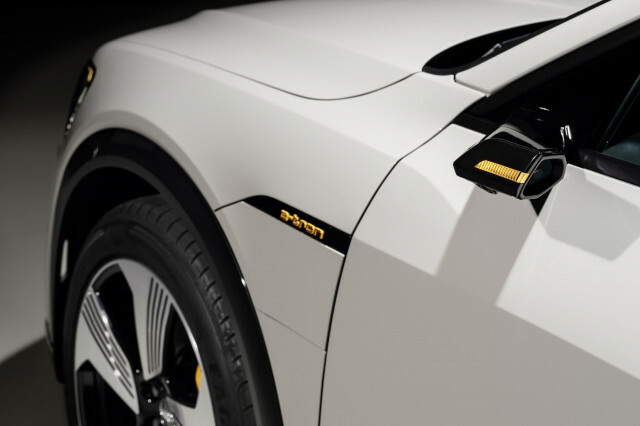 And the e-tron uses a higher-speed version of the CCS fast-charging connector, one that will be shared by every German electric car and all U.S. entries (eventually) except Teslas. Audi is relying, at least in part, on the charging sites now being funded and built by Electrify America. That’s the entity that will spend $2 billion of penalty funds from its parent VW Group to build a nationwide fast-charging network, as part of a settlement of its diesel-emission cheating scandal with the EPA and the California Air Resources Board. Audi says 500 such sites will be “complete or under construction” by next July. Still, like the Tesla Model S for the first year or so of production, there are likely to be very few places to fast-charge an e-tron at full speed. As happened with the Model S, that will improve over the next few years—though e-tron drivers will be sharing their charging locations with drivers of all sorts of other electric cars. They won't have the fast chargers all to themselves as early Tesla drivers did. 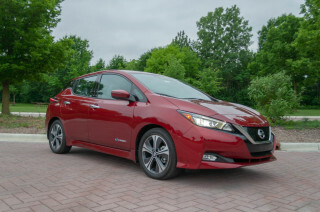 The e-tron’s portable 9.6-kw charging cord can operate at 120 or 240 volts, with pigtails for standard North American wall outlets and 240-volt NEMA 14-50 sockets. The company has also partnered with Amazon to manage installation of home charging stations, under the somewhat unwieldly title of “Audi Home Charging powered by Amazon Home Services,” which it claims will make ordering a home charging station—and getting it installed—as easy as any other Amazon order. In layout and specs, the Audi e-tron is roughly similar to the rest of the luxury crossover utilities that have been announced or put into production. Its 95-kilowatt-hour liquid-cooled battery pack sits below the cabin floor, with a pair of liquid-cooled electric motors of unspecified output. In light to normal use, the e-tron operates as a rear-wheel-drive vehicle, with the front motor adding power when needed. Power has been estimated at 265 continuous horsepower with bursts up to 400 hp for acceleration. The company says the e-tron will accelerate from 0 to 60 mph in 5.5 seconds, and is capable of a top speed of 124 mph. Individual wheel braking using the traction control system allows torque vectoring for increased stability. Audi calls the result “a new generation” of the Quattro all-wheel-drive system the brand is known for. Three degrees of regenerative braking (which Audi insists on calling “recuperation”) are offered. The lowest setting behaves more or less like a conventional car with an automatic transmission, offering almost no braking on liftoff. At the highest degree, Audi says the e-tron can be driven almost entirely with only the accelerator pedal, the “one-pedal driving” that electric-car drivers often prefer. Audi held its e-tron premiere in San Francisco, temporarily morphing the city’s Bill Graham Civic Auditorium into a “Tech Park” filled with displays of the brand’s advanced technology. The event was the third in a flurry of all-electric vehicle announcements of various sorts by a trio of German luxury brands that often march in lockstep. First Mercedes-Benz unveiled the production version of the EQC in Stockholm on September 4. Last Monday, BMW showed its Vision iNext concept for a flagship large all-electric utility vehicle, though it likely won’t reach production until 2022. Note that BMW hasn’t yet debuted the iX3 that will precede the iNext by two years. Rather than a dedicated vehicle like the e-tron and EQC, the 2020 iX3 will be a battery-electric version of the latest-generation X3 compact luxury crossover also offered in much higher numbers with gasoline and plug-in hybrid powertrains.